Can we talk about summer tomatoes for a minute? The season for America’s favorite “vegetable” is nearly in full swing and we here at Refinery29 could not be more excited! Not only is it fun to pick out tomatoes in every shape, size, and color at the market — sometimes the gnarliest ones are the most delicious. They’re also one of the most hydrating foods at 94.5% water content, which is key this time of year. 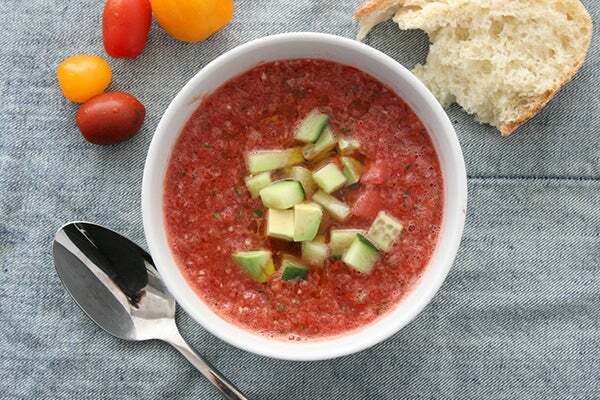 The point is we could eat summer tomatoes all day long, so we came up with a breakfast, lunch, and dinner recipe to help you (and us) make the most of the season’s best! Breakfast: Give the classic BLT a little extra protein and heft by adding soft scrambled eggs in the mix — it’s the perfect way to start the day. Feel free to swap in one fried, poached, or sliced hard-cooked egg, if you’d prefer. 1. Cook bacon in a non-stick skillet over medium heat until crisp, about six minutes, turning over once. Transfer bacon to paper towels to drain and reserve drippings in the skillet. 2. Meanwhile, whisk the eggs, one teaspoon water, and 1/4 teaspoon each salt and pepper in a large bowl. Add eggs to the skillet over medium heat and cook, pushing eggs to the center until just set, about two to three minutes. 3. Spread mayo on one toasted bread slice. 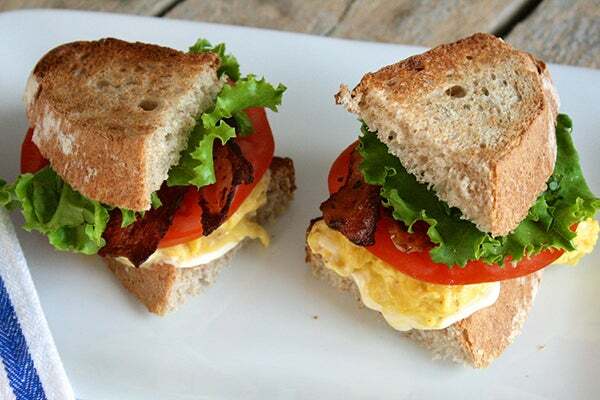 Top with scrambled eggs, bacon, tomato, lettuce, and the remaining bread slice. Lunch: Serve this no-cook meal to a crowd or store individual portions in the fridge for up to three days, so lunch is ready to go when you are. Don’t like heat? Replace the jalapeño with one extra garlic clove and a squeeze of fresh lime juice. Chop up some extra watermelon, cucumber, or pepper for garnish, if desired. 1. Put the red onion and red wine vinegar in a bowl and set aside 10 minutes (this will soften the onion’s bite). 2. Transfer the red onion and vinegar to a food processor fitted with the blade attachment. Add the watermelon, tomatoes, cucumber, red bell pepper, jalapeño, and garlic and pulse until combined and almost smooth. Add 1/2 teaspoon salt and 1/4 teaspoon pepper; pulse one to two times to combine. Taste and add more salt, if needed. 3. Divide the gazpacho among bowls. Top with avocado (and/or chopped watermelon, cucumber, pepper). Drizzle with olive oil. Serve with crust bread, if desired. 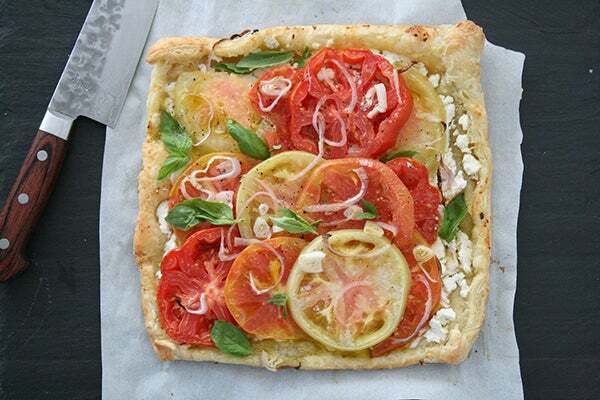 Dinner: Heirloom tomatoes work best with this quickie savory tart. Look for ones that are similar in size, but choose a few different colors to recreate this patterned effect. Goat milk ricotta gives this 30-minute dinner a subtle tangy flavor, but good-quality cow milk ricotta will do the trick, too, in a pinch! 1. Preheat oven to 400˚. Unfold one sheet puff pastry on a lightly floured piece of parchment paper and gently roll out to a 10-inch square. Lift up parchment and transfer to a baking sheet. 2. Spread ricotta on pastry, leaving a one-inch border on all sides. Sprinkle parmesan over the ricotta. Layer the tomatoes, overlapping slightly, on top of the cheese. Sprinkle with the shallot and 1/4 teaspoon each salt and pepper. 3. Fold the pastry edges in to make a square-shaped tart. Bake 16 to 18 minutes or until the pastry is puffed and golden. Top with basil leaves, olive oil, and flaky sea salt to taste, if desired.